I heard about the very unpopular Irish government and Brian Cowen, but I didn’t really try to be interested. Did you know that Ireland is one the rare European countries we French people don’t even hear spoken about? To be honest, I didn’t even know the president’s and prime minister’s names before living here. Nor that the president was a woman, which is the kind of thing the media usually like to talk about, in order to demonstrate the evolution of sexual equality in politics. In a comparison between Irish and French politics, I wouldn’t pretend to compare them according to their political system, because I am not a governmental expert. My matter is more focused on observing people and politicians’ states of mind in relation to these early elections in Ireland, and the next elections in France. Talking with some of my Irish friends, I’ve realised that everybody seems to be concerned by these elections. We all know about the country’s desperate economic situation, reflecting the economic crisis cracking down all over Europe. Therefore, Ireland needs a strong and popular government to face it. I went to Dublin in November, and there I landed up right in the middle of a demonstration against austerity policy and government. I was amazed to see how people of any ages or from any social background gathered to make the Irish government hear their voice. I cannot help but establishing a link between these demonstrations and the early resignation of prime minister Brian Cowen, and what is currently happening in the Arab world – in Tunisia, Egypt, then now in Algeria, Libya, Bahrain or Yemen – that united wave of revolt against an oppressor government which has left its legacy. Even if the reasons that have led to the uprising are quite different, it seems that the entire world is being indignant in these times and strongly claims respect, dignity and freedom. A funny coincidence: the French writer and resistance fighter under the Occupation Stéphane Hessel has just published a short essay entitled “Indignez-vous!” (“Get indignant!”), a real call for the spirit of revolution. Everywhere, democracy seems to be strongly put to the test. In France, people like demonstrating. Be it against retirement age’s raising or against mass redundancy because of enterprise’s closing, demonstrations are clearly part of our national history. But in the same time, we are witnessing something a bit strange in comparison with Irish elections. In France, no one really cares about the next elections, cantonales, which are general council elections. After the recent displays of what democracy means and fights for freedom all over the Middle East, that behaviour, that lack of interest in elections, seems quite indecent. We won democracy, we won the right to vote for anybody (women in France were granted the right to vote in 1944), we are lucky to have the means to express ourselves and be heard. And we spoiled children waste that chance. Last year, a 53.64 % abstention rate was recorded for the first round of regional council elections, which is a record rate for elections of that kind in France! Indeed, the only elections French people currently feel concerned about seem to be the next presidential elections, coming in 2012. But again, our chance to vote is being wasted on ridiculous and useless brawls between parties, and even inside the same party (you may have heard about the socialist party squabble). The media can be blamed too, showing us these childish games instead of what really matters, like which issues the candidates would focus their campaign on, or what they think about what is happening in the world. As Stéphane Hessel asked us to do, I am getting indignant. 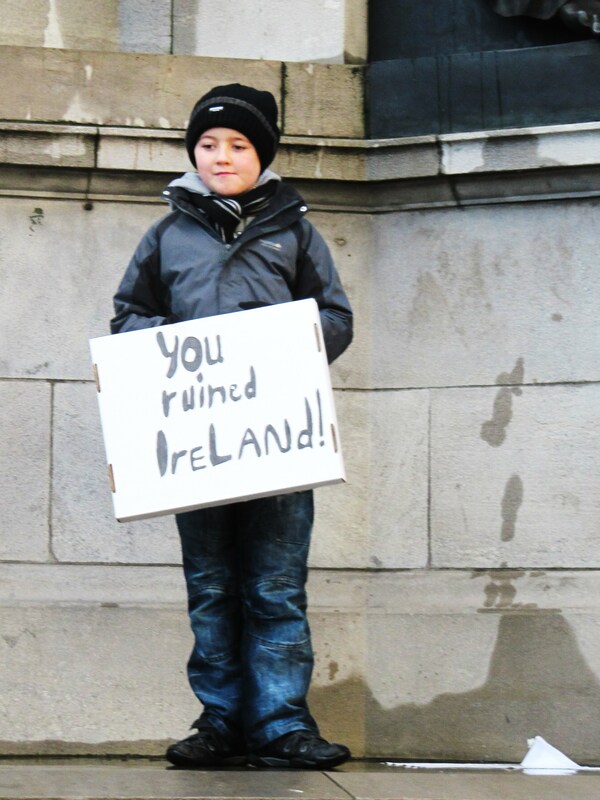 French people are probably better at protesting and criticizing against the government than at mobilizing for real change, as you did in Ireland. Why? Simply because they are too lazy and have forgotten how precious democracy really is. 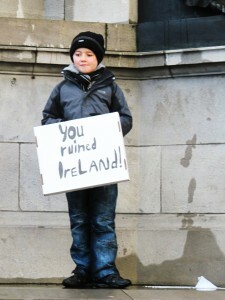 I hope the recent Irish example will help them to remember.